Avior Boeing 737-200 ADV, registration YV-1576. 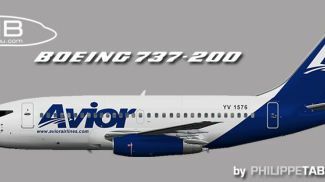 A repaint of the FAIB model (FAIB_B7372.ZIP) by Philippe Tabatchnik. Just drop the correct "texture.avior yv1576" folder for your Flight Simulator version into the correct base model folder specified in the fltsim.txt file. (The base package must be downloaded separately to use this paint). The archive faib_732_roi_1576_fsx.zip has 8 files and directories contained within it.